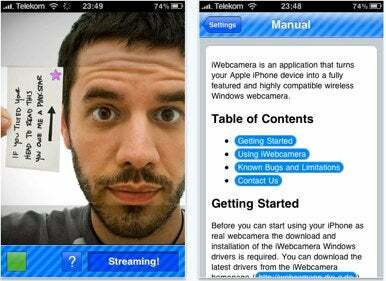 Drahtwerk has released iWebcamera 2.0, a major upgrade and rewrite for its app that turns your iPhone into a Webcam. New in iWebcamera 2.0 is full support for the iPhone 4, including its Retina display and front-facing camera. iWebcamera lets you use your iPhone as a Webcam for applications like Skype, Windows Live Messenger, YouTube and other Webcam-enabled desktop apps running on Mac OS X 10.5 or 10.6 as well as Windows 7, Vista, and XP. iWebcamera offers two quality options and comes with a built-in manual to help get you started. An instant-pause mode pauses video streaming instantly without exiting the host application on the computer. For kicks, the app also includes a YouBlue effect, which turns your face blue. Version 2.0 is a complete rewrite of the original app and makes use of the new APIs introduced with iOS 4.0 while also supporting the iPhone 4’s Retina display and front-facing camera. Drahtwerk notes that iWebcamera doesn’t support Apple iChat or Photobooth due to certain restrictions in those apps, but every other webcam enabled app should work fine. iWebcamera costs $5 and requires an iPhone 3G, 3GS, 4, or 4th generation iPod Touch running iOS 4.0 or later.